Hello & Happy Thursday my favorite Crafty Peeps! Don't worry... the weekend is right around the corner for ya! Today I've got a couple of Christmas cards to show you! They are both beautiful. What a great way to use up all the pieces. I love you plan of getting ahead of the holidays. I look forward as always in seeing these creations. These are both fabulous Theresa! I love how you used the negative pieces for the second one so they didn't go to waste. I love both of your cards Theresa!!! Glad you didn't waste those trees! I love the embossing on the vellum! Really makes the sentiment stand out. Both cards are beautiful!! Love the gorgeous backgrounds!! I love how you used all the trees!! Have a great day. Great plan! They are both beautiful! Theresa, you are completely brilliant! I love that you made the second card with the scraps... both versions are gorgeous! I love the Christmas tree clusters and the festive shading for the background. The sentiment is so happy! I love the design in which you did it. 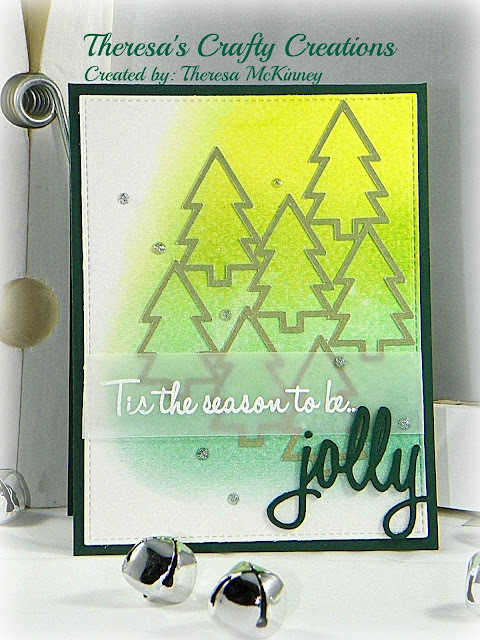 The vellum is gorgeous and the jolly is just so.. jolly! Hehe! So happy to see Christmas cheer tonight. Wonderfully done, my friend! I love that you reused the trees! !Super cool! Gorgeous cards my friend!! Love your card and how you used the vellum. Looks fantastic!